The world of Information Technology is constantly changing. 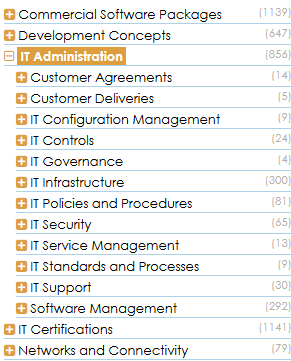 To ensure that the WAND Information Technology Taxonomy includes the latest terms, we have updated all of the IT areas including Commercial Software Packages, Development Concepts, Networks and Connectivity, IT Administration, and IT Certifications. The WAND Information Technology Taxonomy includes nearly 3700 terms and 424 synonyms. In the area of IT Administration alone, you'll find Software Management, Support, Customer Deliveries, and Customer Agreements, as well as IT Infrastructure, Security, Governance, Policies and Procedures, Standards and Processes, and more! The taxonomy update also reflects the latest terms in Cloud Computing, Application Frameworks, and Software Packages. This taxonomy, as with all WAND Taxonomies, is available by itself or as part of a subscription to the WAND Taxonomy Library Portal.